(spc.rs) - With the blessing of His Holiness Irinej, Serbian Patriarch, His Grace Atanasije, Bishop of Hvosno celebrated on Sunday, October 21, 2012, the Hierarchal Divine Liturgy in the church of Saint Sava on Vracar, with the concelebration of the hieromonks from St. Paul's Monastery of Mount Athos and the clergy from the Archdiocese of Belgrade-Karlovci. His Grace Basil, Bishop of Wichita and Middle America Antiochian Patriachate, attended the Liturgy. Following the Divine Liturgy the relics of Saint Maximus were brought into the church. 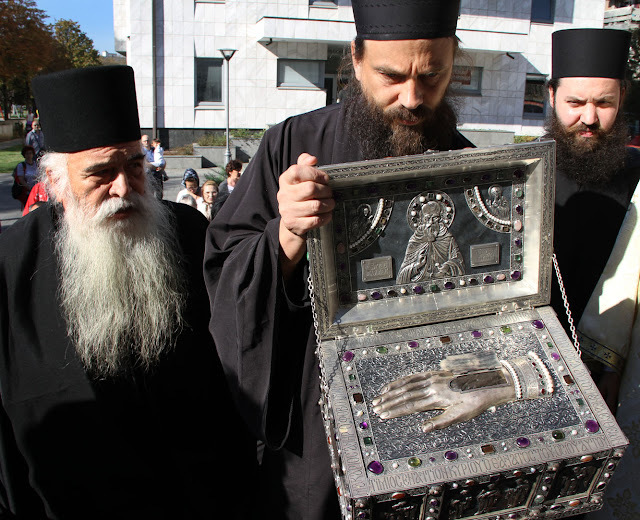 Multitude of the faithful people of Belgrade showed respect and venerated the holy relics.